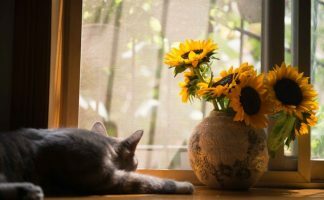 Do you have an indoor kitten that seems a little bored? Or perhaps an older overweight cat who desperately needs some exercise? 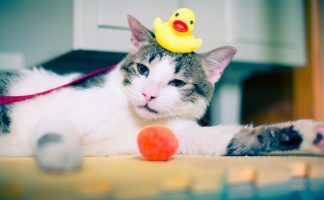 Although cats are great at keeping themselves occupied, even independent animals can benefit from structured playtime. 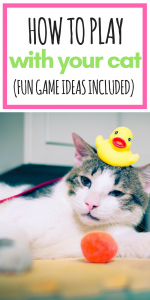 Have you ever considered games for cats that you can join in on? You should! You can either make or purchase these toys that include a feather or bird-like bobble hanging from a pole. 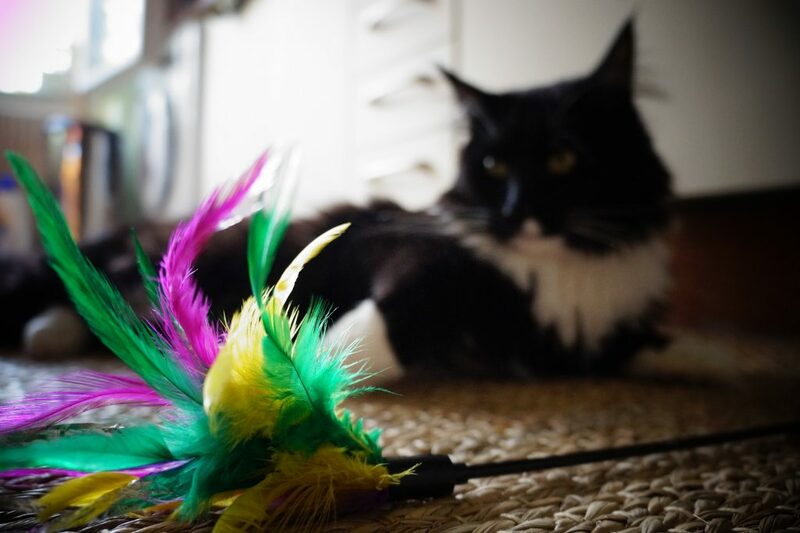 Walk (or run) around your home, encouraging your cat to chase and swat the toy. 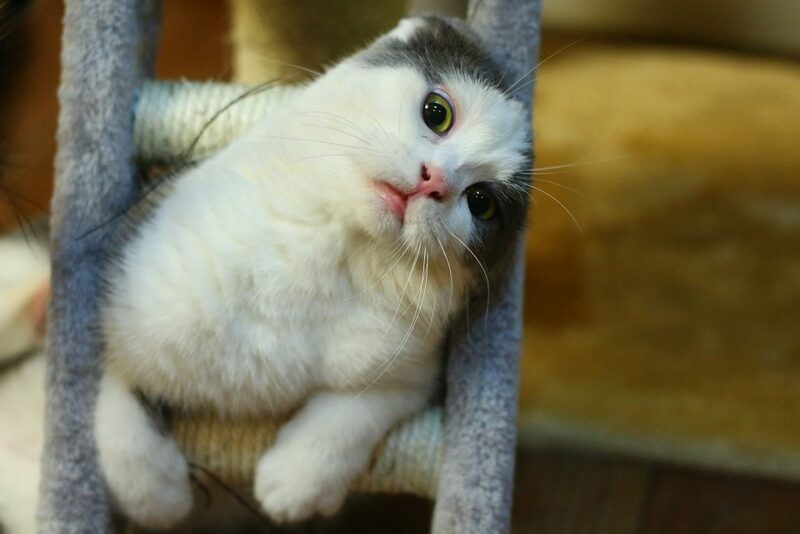 Try leading your kitten up a cat tree, or onto his favorite perch, and back down again. 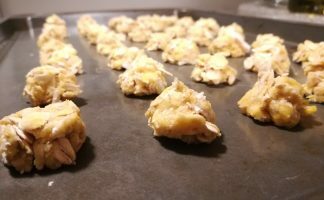 This is a particularly good idea for an overweight or obese cat: Make their food into a game that requires “hunting.” Simply put a little kibble (or small, cut up cooked meat) into a store-bought puzzle feeder. These often look like fake Easter eggs with different size squares and circles cut into them. As your cat bats and paws at the feeder, the kibble falls through the holes. Like the puzzle feeder, the box of toys requires your cat to work to get his or her toys out of a box. Take a shoe box (or, you know, one of the dozen of Amazon Prime boxes you have lying around) and cut different-sized holes into it (making sure that the toys will come out with some jostling about). Load it up with a few fake mice and tape it back up. Let Whiskers bat it around until she gets out all her toys or gets bored. One of my personal favorites! Invest in a laser pointer or small flashlight and use it to lure your hunter all over the house. Cats go crazy for this game, and it’ll keep them occupied (and a little frustrated) for quite a while. Some people suggest ending this game by tossing your cat a real toy he can actually capture so he doesn’t feel robbed. Most cats love catnip: it’s in the name! Stuff some into your kitty’s favorite toys and watch your cat go wild. Tie one of your cat’s favorite toys to a long piece of string. Hide behind the couch and tug at the string, making the toy move. Your cat will try and pounce. Keep moving around the house for as long as your cat is interested. Same idea, but hide behind the door and hang the string over to the other side. Pull the toy up and drop it down, as your cat tries to capture their prey. This is basically “fetch”, except I wouldn’t expect your cat to bring the toy back. 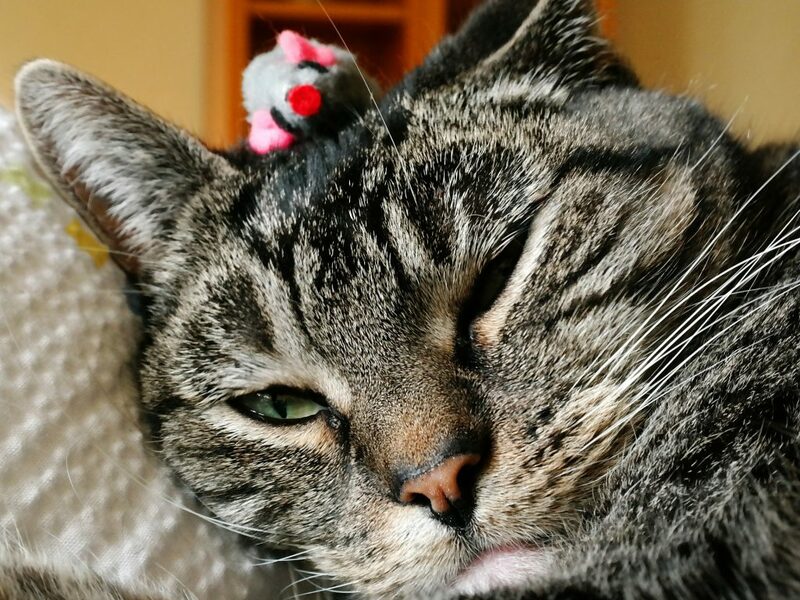 Simply toss a mouse or fuzzy ball around and watch your cat dart after it. He’ll probably bat it around some and then leave it be, so this is also exercise for you: Get up and grab the toy and toss it to your cat again. This isn’t strictly a game, but cats love to hide in bags. After your next trip to the grocery store, take the brown paper bags you bring home and leave them in cozy places around the house to hide in. Hide your hand (or one of those toys on a string) under a blanket, and move it suddenly. Cats are natural-born hunters, and the mystery prey is just too enticing: Your cat will pounce! It’s cliché, of course, but a ball of yarn is every cat’s dream. You could just place the yarn in front of your cat and let her have at it, or hold the end of the yarn ball and toss the rest in her direction. Let her catch it, and then try to unroll it all (monitor her, though, so she doesn’t strangle herself!). Wait, what? These exist? Yep. Welcome to the 21st century! You can download game apps designed specifically for cats. Often they are online versions of the games above, like a red dot that darts across the screen, or fish in a pond that your cat has to “catch” with his paw. Curious? Check out Games For Cats or just visit the app store. 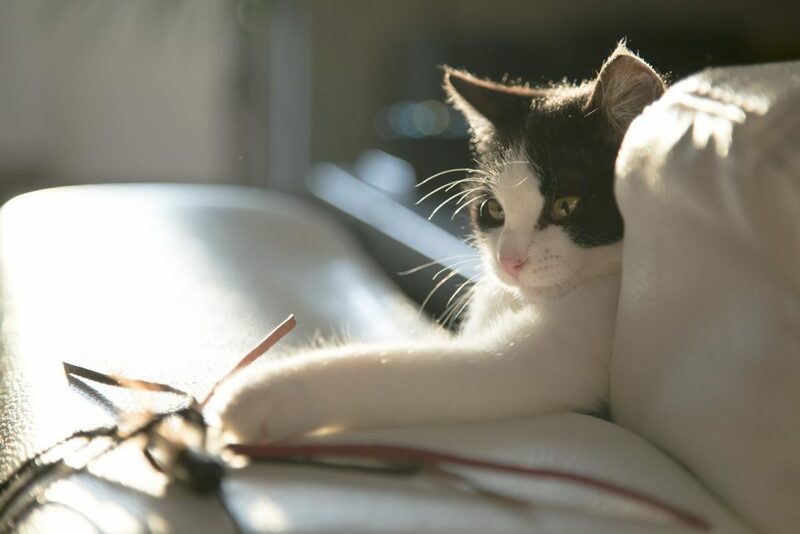 Worried about your cat’s claws damaging your screen? Invest in a screen protector that you can remove and replace if it gets beat up. Now that you have some new tricks up your sleeve, there’s nothing standing between you and playtime with your cat. Have fun!